I'm definitely curious about how it turns out. The last two times Bill Clinton was in town, the event organizers were giving away tickets by the time the shows were ready to go. One was on his own at the Ex, which turned out to be a real mess - reduced ticket prices to $5 with admission to the Ex , the other was the road show he did with Bush Jr. Tickets went well initially, then sales dwindled away. The local media barely even covered the event in the end. I was at the Ex the day Clinton was there. A lot of people in line for the tickets, but not that crowded given the size of the venue. Tony Hawk (professional skateboarder), who was there the same day, probably drew a bigger crowd. That is were we were. It's sad that there has to be fundraising for this sort of thing. if it's a needed service we should all contribute ! i don't exactly like taxes but prefer taxes over some scuzzy fundraising scheme . unfortunately more and more fundraising is taking place because governments don't want to raise taxes for needed services - but it's really PEOPLE who don't want to pay their share , who force hospitals etc. into the hands of FUNDRAISERS ( who only too often take a good slice of the money for themselves ) . I think I would but I'd let someone else eat her. Does she taste like chicken or Alaska King Crab? They were talking about this on the local news tonight and the commentator said that he would much rather pay to see Tina Faye. I agree with him. It is a known fact all politicians taste like skunk. Obviously you have never eaten one. (JTT)I think I would but I'd let someone else eat her. Does she taste like chicken or Alaska King Crab? (Ionus) It is a known fact all politicians taste like skunk. Obviously you have never eaten one. If you know of a good use for a dead politician I would like to hear it. At least live ones can be used for bike holders. Perhaps that is so, however, it is a score for Canadians who like their health care system and for health care reform supporters here in the US. I feel bad about the chances for success for the children's charity with Palin as a speaker. I realize the organizer of the gala dinner thinks people should put aside their political leanings and think of the cause, but the whole point of having known speakers is speakers themselves and whatever qualities they represent having an influence on the audience which would result in more favorable contributions for whatever charity a dinner is being held for. If the speakers is not well received then the whole point of the speaker being there is kind of backfired. Dennis Concordia, one of the organizers of an April, 2010, gala dinner which was initially supposed to benefit a cancer centre and a hospital, felt he'd recruited an engaging speaker when he booked the former Alaska governor. But when he announced her impending arrival last week, news that a vocal critic of public health care would be speaking at a benefit for Canadian hospitals was received with as much warmth as Paris Hilton at a PETA rally. News of Ms. Palin's speaking engagement was picked up in American political blogs including the Huffington Post and Daily Kos. The hospitals meant to profit from her visit, the Juravinski Cancer Centre and St. Peter's Hospital, found themselves on the receiving end of angry public reactions rather than charitable donations. Over the span of a week the hospitals received about 70 e-mails and phone calls. 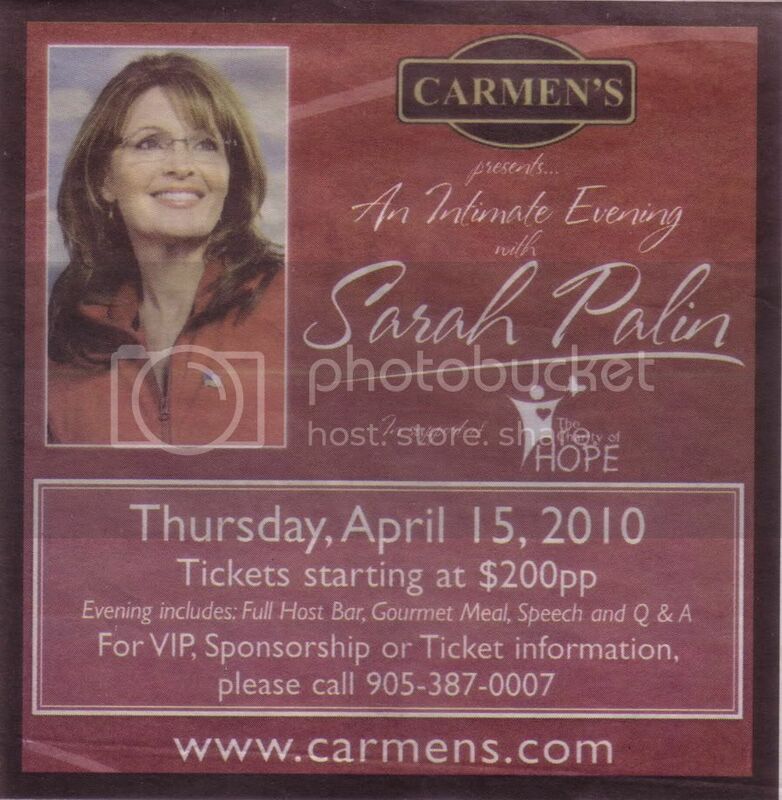 “They were people from the community who were concerned about Ms. Palin, mostly about her political position on topics like health care,” said Heather Pullen, a spokeswoman for Hamilton Health Sciences, a network of facilities that includes Juravinski and St. Peter's. Mr. Concordia and his co-organizers announced yesterday that the proceeds of the gala dinner would benefit a children's charity, Charity of Hope, rather than the hospitals. It does seem that the organizers want Palin no matter what. She was engaged to speak on behalf of two Hamilton hospitals. Rather than cancel her appearance, as one might think, the recipient of the proceeds are now being diverted. I wonder who will know what actually happens to the proceeds. As an aside, the Juravinski Cancer Centre, is to be the new name of the Henderson hospital. That is another debacle in Hamilton. Most people want to keep the Henderson name as it was named such many years ago after a very prominent woman. Margaret and Charles Juravinski have donated $43,000,000.00 to the hospital and now the Health Sciences Centre plan to name it after him. Even though there has been extreme public opinion, they are going ahead with the name change. even people in Toronto know the Henderson. Yup. Juravinski already has the Cancer Centre wing named after him. Now he wants the whole hospital. Local politicians, historians and the public are up in arms but to no avail. The city thought they could block it because they own the land that the hospital is built on. It seems that they have no say since they only own the land. Charles has now changed his legacy to that of a greedy man who donated 43 million dollars to see his name on a hospital. The donations are certainly appreciated, but this is too much. Intrepid: Are you always this angry? No, she intersperses angry with frequent episodes of stupidity, inaneness, and her always popular digressions on grammar and language. The organizers only have to bring in paying customers - any political leanings will do - and well-known speakers help in that task. It seems that Sarah will, indeed, be coming to Hamilton in April. The tickets START at $200.00 per plate. They have dropped the hospital as the recipient and have now changed to the Charity of Hope to support. That charity is run by the owner of Mercanti Auto Collision in Hamilton. It seems, by the list of organizations that they have helped through their charity that hospitals are still included. I guess this was one work around for the organizers. I wonder if any of the kid foundations will benefit. House of Hope Society Inc.
That Q&A session ought to be good. Anyone who steps up to the mike will be given a question to ask Sarah. Q: Can you see Russia from Alaska? Q: Just a quick follow up to that last question, have you ever tasted Russian caviar? Q: Why is it that American conservative voters are so easily won over by abject stupidity?